The American Disabilities Association (ADA) classifies parking spaces according to the basis of access aisle width into Standard (cars etc) and Van-Accessible Parking Spaces. The van in context to accessibility is not the usual mini-van, small bus or SUV. Vans here mean specially modified vehicles modified or designed for transporting a person in a manual or powered wheelchair. 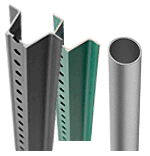 Alterations include the addition of a rear mounted platform ramp or lift. Van-accessible parking spaces need to have an aisle width of 8 ft at least in order to facilitate convenient movement. 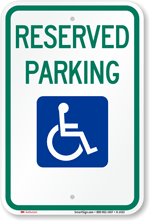 Foremost, all van-accessible signs like the regular ADA reserved parking signs need to include the International Symbol of Accessibility (ISA) – a blue sign with a man on a wheelchair. 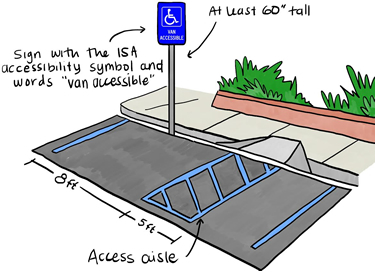 In addition, specifically for van-accessible parking spots, the ISA symbol needs to be supplemented with ‘van-accessible’ text or sign. Access Board's ADA Accessibility Guidelines (ADAAG) do specify the content, symbols and contrast on the signs but not a fixed color or size. Local or State jurisdictions may address these particulars, if any. 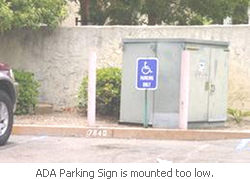 ADA (and ADAAG) provides simple guidelines about posting Van Accessible Signs. •	No specific height is mentioned in manuals but at least 60 inches above the parking surface is highly advisable for maximum visibility. Higher than 60 inches would be much suitable for van drivers. •	The van accessible sign should be placed so that it is not obscured by anything including a standing van, vehicle or other obtrusive objects. In general, van accessible signs are posted in front of the space for a quick view on a pole. 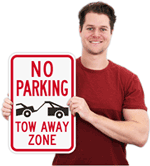 However it is acceptable for them to be mounted on walls, fences or other similar paraphernalia as long as they are in close proximity to the parking space. •	Parking spaces should be designated with an access symbol but ADAAG does not particularly need the designation of each and every space. Sign alternatives at each space are acceptable. The only mandate is that the reserved accessible parking spaces are designated and clearly distinctive from other parking spaces. The ADA only provides with basic set of essential guidelines. Local and state authorities have the right to modify these directions keeping in mind that the key ADA rules are always met. 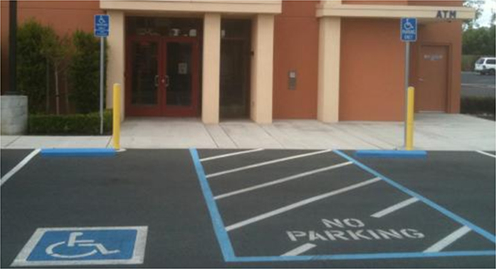 There are no stipulated details under ADAAG about the color or method in which accessible spaces are to be striped. The code does not include the placement of ISA symbol on the parking space surface. These details on requirements for striping including color, surface decals or designations may however be provided by the local codes. Equal access to parking spaces is everyone’s right, regardless of the nature of the driver or his vehicle. Marking accessible parking spaces with access signs make sure that every individual gets his or her fair share. These signs are an excellent way to adhere to the implementation of ADA guidelines.